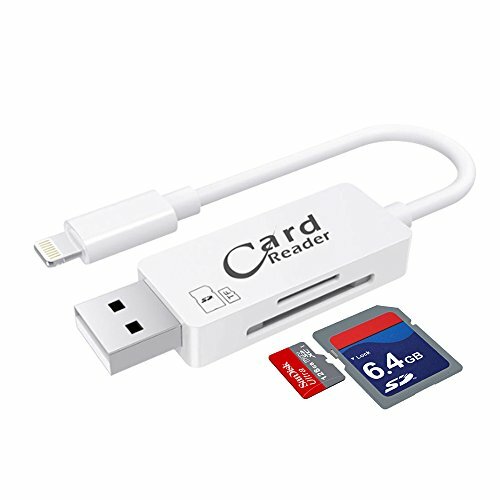 MOSTOP 2-in-1 8 Pin Lightning Interface Card Reader With OTG Function Will Offer A Compact Solution To Access The Most Popular Flash Media. Perfect & Fast Friend Of You. Super speed USB 2.0 for maximum performance. Just download the amazing video such as Hollywood Movie to the TF / SD card, you will get the personal moveable home cinema, whenever or wherever, you can enjoy the excllent content by your iPhone / iPad with our card reader. Synchronous Charging & Data Transfer, made to do more together. A series of copper wires rather than single wire provides you more better rechargeable safety & fast data transport guaranty. PLUG & PLAY: Do not need to jailbreak your iPhone / iPad, just download an APP "iUSB Pro" from iPhone APP store. Simple to operate, copy movie and music on your SD card, and watch / listen them with your iPhone / iPad. COMPATIBLE WITH VARIETY FORMAT: Video: MOV, MPG, SWF, VOB, WMV, RMVB, AVI, MP4, RM, MKV, FLV, 3GP. Pictures Format: JPG, JPEG, BMP, GIF, PNG, TIF, TIFF. Audio FORMAT: MP3, WMA, WAV, M4A, AAC, A4E, OGG. File Format: TXT, PDF, PPT, DOC, XLS, XLSX. CHARGING & DATA TRANSFER DESIGN: Latest & Humanised card reader design concept, when transmit data also could charge your phone at the same time. Do not worry the condition that your device without power when transmit data. PROVIDE MOBILE PHONE MEMORY: Support 8G~64G memory cards (TF Card not include). Taking pictures / video will store TF card directly. No need to worry mobile phone memory is low.